Image 10.0 treadmill is perfect for people on tight budgets. At just $400 you would get features you wouldn’t normally expect from an entry level treadmill below $500. If you want a decent machine but you don't have the money, then this Image model is definitely worth researching. It is, in my opinion, the best treadmill below $500. Even at a price this low, the Image 10.0 still offers a 2.0hp continuous duty motor with power inclines of 1.5 to 10% and speeds of 0 to 10mph. It aslo has a user weight limit of 250Lbs, which is surprising since it is only a $400 machine. The roomy 50” x 18” non-slip tread belt is perfect for joggers. And if you want to workout in your target heart rate, you just grip the pulse sensor and it'll measure your heart rate. The 4 pre-programmed workouts: 2 fat burning and 2 aerobics, provide you the challenge for a more effective workout. While the computerized console (another impressive feature) lets you visually track your progress with 4 feedback windows, showing the speed, time, distance and calories burned. The Image 10.0 also comes with space-saving design... allowing you to fold the treadmill after use so it doesn’t take up too much space. (approximate folded dimension is 22" L x 36" W x 65" H) This is perfect for those with limited areas at home. And finally, this unit is iFit compatible. If you choose to use this feature, it would provide you with motivation, coaching and fitness personalization to make your exercises more efficient. The downside of this model is that its warranty is too short, only 90 days. Also, low quality materials were used in manufacturing this machine, but that is something to be expected from budget treadmills. 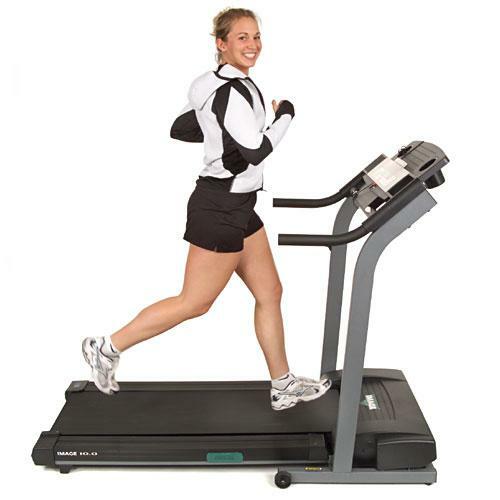 I would recommend Image 10.0 treadmill for people on a limited budget. No other $400 machine even comes close to this model in terms of features and specs.